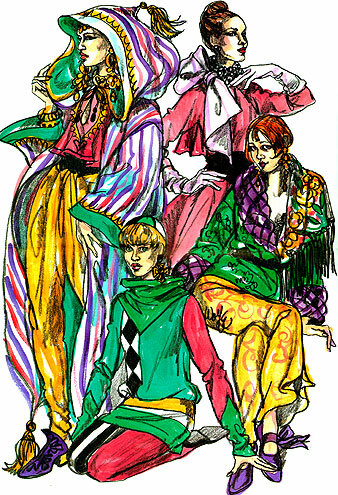 My career as a fashion illustrator really began with paper dolls, of that I am certain. As a little boy, I loved paper dolls and was enthralled by their fashionable outfits. I even liked the tedious task of cutting them out, oh so carefully. Guiding my scissors around the little outfits forced me to observe the flow of fabric, how it hangs on bodies, the difference between structured taffeta, clingy jersey, frothy furs. Those observations were to stand me in good stead in the career that lay ahead of me, although I didn’t know it at the time. I always admired fashion illustration which was everywhere when I was growing up before photography virtually wiped it out of existence. Even little department stores in small towns like Ashtabula, Ohio, used full page fashion illustrations in local newspapers daily. When I got my first job in the advertising department of my hometown’s family-owned small chain of stores (writing and proofing copy) all the fashion illustration was provided by an art service based in Chicago. I had taken a Saturday course in fashion illustration at the Cleveland Institute of Art when I was in high school and I had a dream. “Imitation of Life,” the 1959 Lana Turner melodrama movie opened locally and the department store’s beauty salon wanted to run an ad featuring Lana’s hair-do. There was no time to commission art from Chicago, so I volunteered to do a sketch. When the ad was published, I was walking on air! I’d taken the first step towards my dream career. I worked in Ohio for nine years, honing my skill as an illustrator. After a while I began to get national attention and awards for my advertisements (I did the layouts and copy as well as the art). I also got the chance to get involved in the fashion aspects of the business, buying merchandise, organizing and commentating fashion shows. I got married to an English woman (who’d come to America as a teen-ager in a circus!). In 1968, along with our three children, we went to England for a vacation, my first trip to Europe and a life-changing experience. My wife insisted that since we were going to be in London that I take a portfolio of my work around and show it to professional people there, gathering criticism that would help me to !improve. I hated the idea but finally was forced to make an appointment. I went to see the Fashion Director of Fortnum & Mason, then the most chic store in London. My wife told me to “Start at the top, you can always work your way down.” It turned out that I started at the top and stayed there! After showing my work, I waited, sweating with nerves. Then I was asked a question that changed everything for me. “Can you go to Paris this afternoon?” Could I? You bet! The store had signed Ungaro for an exclusive collection and wanted to advertise it in British Vogue. I did the ad that appeared on the opening page of the magazine and followed it with an advertising campaign that went on for many years. Of course, I never went back to Ohio. For the next decade I drew and drew and drew, literally thousands of fashion illustrations for advertising, newspapers and magazines. I became the chief fashion artist for the London Sunday Times, worked for Women's Wear Daily and almost every top store in London and Paris. My dream had come true. I was the most popular (and prolific) fashion illustrator in London. But I wasn't satisfied. I wanted to be more involved than merely illustrating style, I wanted to become a part of the fashion system. I became Creative Director of a small start-up company providing insider trend information to American stores and designs. In that position I got to travel to all the world's fashion capitols from Paris and Milan to New York and Los Angeles, to Tokyo and Bombay. I went to thousands of fashion shows everywhere, sketching like mad because this was before the designers like Yves Saint Laurent allowed photography. (Of course, photographers were soon to supersede artists and fashion illustration became almost as archaic as blacksmithing.) It may seem glamorous and it was, but it was also grueling and stressful. Many a time, I worked through the night in Paris or Milan, frantically sketching the clothes I'd seen come down the runways that day in order to produce daily reports on the trend-setting shows. I had developed an understanding and skill set as a fashion trend analyst that became the main thrust of my career as the years passed. I returned to America early in the 1980s and gradually ceased illustrating. How deeply I now regret that I only saved a mere handful of sketches from my years as a fashion artist. But I was grinding out so many drawings that they had no value as far as I was concerned. I was always onto the next illustration, meeting the next seemingly impossible deadline. When my career as a trend analyst kicked-in big time, I missed illustration. That’s when fate luckily led me to the current paper doll community of artists and collectors. Once again, I had an outlet for the skill I’d developed and polished so fervently for so many years. Creating paper dolls today is honestly more fun for me than sketching the Paris collections was years ago, and I happily look forward to a future filled with expressing my love of fashion and my passion for paper dolls.